Floating in the Quest airlock, Expedition 56 commander Drew Feustel and Ricky Arnold switched their spacesuits to battery power at 8:06 a.m. EDT (GMT-4), kicking off what turned out to be a six-hour 49-minute excursion. It was the fifth spacewalk overall for Arnold and the ninth for Feustel, who now ranks third in the world, logging a total of 61 hours and 48 minutes across nine EVAs. The all-time record is held by Anatoly Solovyev, who logged 78 hours and 21 minutes of spacewalk time during 16 excursions. Records aside, the major goal of U.S. EVA-51 was installation of two new cameras on the front of the forward Harmony module that will provide views of Boeing CST-100 Starliner and SpaceX crewed Dragon spacecraft during final approach to a new docking mechanism mounted on the port where space shuttles once attached. The new crew ferry ships are intended to end NASA's sole reliance on Russian Soyuz spacecraft to carry U.S., European, Japanese and Canadian astronauts to the outpost, restoring American space transportation capability that was lost when the shuttle program ended in 2011. Development of the new crew ships is behind schedule and it's not yet clear when the first unpiloted test flights will be possible, but NASA hopes to begin operational crew ferry missions as soon as possible next year. The camera work required Arnold and Feustel to connect power and ethernet cables on a distribution panel on the Destiny lab module. Connecting the wires beneath a micrometeoroid panel, securing them and re-stowing the panel, proved time consuming, but the crew had no major problems. The astronauts then returned to the airlock, collected the new cameras and their mounts and moved up to the front of the station where they were installed and connected to already-routed cables. Live views from the cameras showed they were working normally, sending down sharp views of the Earth 250 miles below. At that point, Arnold and Feustel split up. Arnold climbed on the station's robot arm and replaced a high-definition camera and light assembly on the right side of the station that were not working properly. 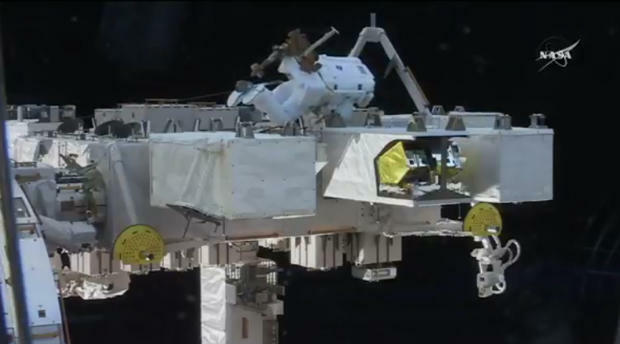 Feustel, meanwhile, ventured to the far left side of the station to work on a payload mounted outside the Japanese Kibo laboratory module. The Cloud-Aerosol Transport System, or CATS, instrument was designed to study the atmosphere using a laser firing through a large aperture door. The instrument failed earlier, leaving the door open, and Feustel manually closed it and wire-tied it in place so the instrument will fit aboard a SpaceX cargo ship later for disposal. Before calling it a day, the astronauts carried out two lower-priority "get-ahead" tasks and then returned to the Quest airlock, beginning repressurization procedures at 2:55 p.m. to officially close out the six-hour 49-minute spacewalk. "Hey, we're home," one of the spacewalkers called from the airlock. More than 120 astronauts and cosmonauts have now logged 1,319 hours and 29 minutes of spacewalk time during 211 EVAS building and maintaining the International Space Station.